O Lord, hear our prayer…. This Sunday and next, Jesus tells parables about seeds (see Matthew 13:1-32). 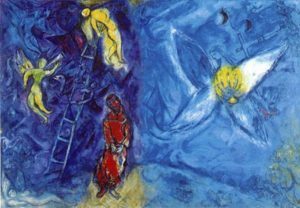 In these parables, some seeds land on barren pathways; some seeds are thrown among rocks and brambles; other seeds crowded out by weeds. And some seeds fall into good soil, becoming great trees strong enough to support the growing kingdom of God. This Sunday and next, the lessons begin with Jacob’s story (see Genesis 25:19-33:17). We can hear Jacob’s saga as one of Jesus’ “good seeds”. His story has it all – the barren land, the rocks and brambles, and plenty of wicked weeds. But Jacob – in spite of himself – also turned out to be “good soil” where the promises of God can start growing into the kingdom. The saga begins by telling us that Jacob and his brother Esau were twins, and were in conflict even in their mother’s womb. (Esau was born first, but Jacob came out holding onto his brother’s heel.) Things got no better as they grew up. As grown men, they continued to compete, and when their father was dying Jacob even connived to steal the blessing that was meant for his brother Esau. Then, wisely, Jacob ran away from home and fled into the desert. the top of it reaching to heaven. For at least 3,000 years, Jacob’s story has been a favorite. As adults we’ve seen his story in great art, and as little children many of us learned all the verses of “Jacob’s Ladder”. Last month I went on a pilgrimage to holy places in France. 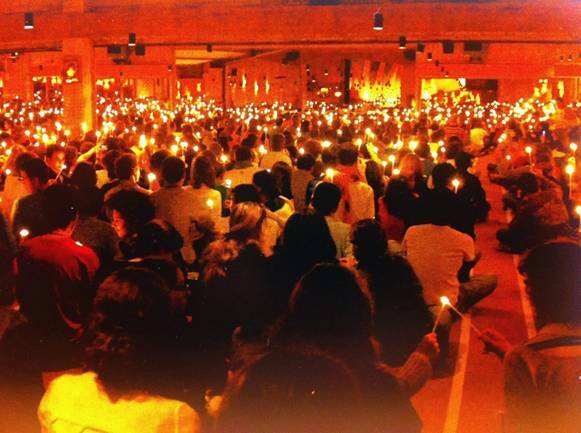 One was Taize, a modern pilgrimage site, where thousands of young people come each week to spend seven days. My pilgrimage really began with a taxi ride from the Paris airport. I was badly jet-lagged, but struck up a conversation with the driver, who had emigrated from Mauritius 20 years ago. My French is pretty minimal, and his English was only slightly better, but we managed. 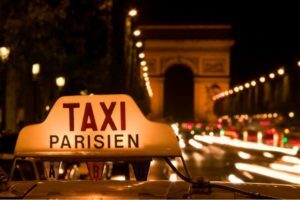 As we approached downtown Paris, the traffic slowed to a crawl… I noticed a sad man holding a piece of cardboard saying that he was a Syrian refugee. Promptly, my driver rolled down the window and gave him some coins. At the end of our ride together, I told him that I was moved by his generosity and gave him much more than the usual tip — suggesting that perhaps he could give some of it to other refugees. He responded with a broad smile and a hearty handshake. Clearly, my pilgrimage was not just to churches. Three days later, our group of 16 pilgrims, led by three Presbyterian pastors and a Roman Catholic priest, climbed into two vans and headed south for Vezelay, which has been a pilgrimage site since the 11th century. The next morning, we were led into the chapter room of the basilica for a deeply moving service in which we were formally commissioned and given medallions which we would wear for the next two weeks. After three days based in Vezelay, our next stop was Taize…where each week thousands of pilgrims, mostly young, come through the gate to spend a few days. Several times each day, people gather with the brothers in their large worship space…. to sing Taize chants, to listen to Scripture, and to pray. But Taize’s method is much more than music and prayer. …but they also gather every day for Bible Study/Reconciliation. The young pilgrims are assigned to groups where not everyone speaks the same language. Perhaps you speak French, and also some English and German. Others speak German, and just a little Polish. (Some are American, and speak only English.) To talk with each other, they have to listen hard, they learn to translate for each other, and they have to struggle to share their own thoughts and beliefs. Through these daily conversations they are not only speaking their own truths, but learning to listen to each other…. that is, learning the languages the others speak. Years ago, when we were in Oberlin, we began an evening Taize prayer service. 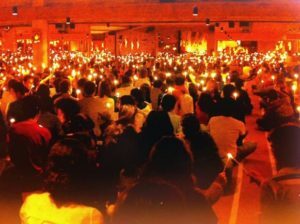 Many college students came to the service, where they learned and loved the Taize chants. Eventually, two of those students decided to go to Taize to experience it for themselves. Several weeks later, in the complete darkness of midnight, we heard people singing on the sidewalk below our bedroom window. The student pilgrims were back, singing “Jubilate Deo!” in a joyful round. The next day, the pilgrims told us more of what Taize is really all about. Both were the children of divorce, and neither had been in contact with their fathers for years. 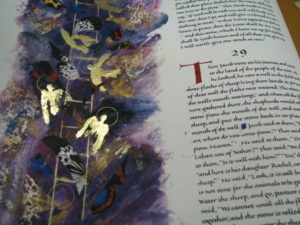 But while at Taize, in the midst of the sharing circles, struggling to communicate with others who didn’t speak their language, singing and praying in worship, both decided to try to contact their fathers, and try again. Over the next year, that contact happened for both of them, and the family began to talk to each other again. A way of singing, a way of praying, and a way of reconciliation. 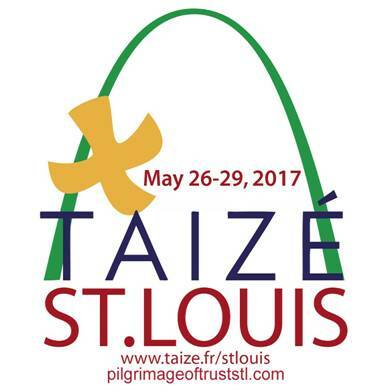 Most who come to Taize spend a week there, from Sunday afternoon through noon the following Sunday. Worship for each week follows the pattern of Holy Week, leading up to Good Friday, Holy Saturday, and Easter Sunday. 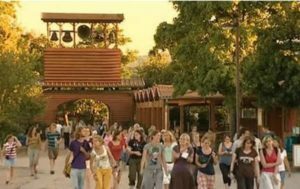 Our pilgrimage was planned so that we could worship at Taize each of these three days. On Friday, our first day, most of our group huddled together next to the wall, yearning to be fully a part of this worship experience, but reluctant to sit on the floor in the midst of hundreds of youngsters. On Saturday we split up and moved towards the center. Part of the Holy Saturday worship is having a candle you are holding lit by a neighbor, and then passing the light on. I noticed that several people behind me did not have candles. Beginning to feel confident about this place, I went to get them some. Having found that the candle bin was empty, I gave them mine. A tiny gesture, but meaningful to me. 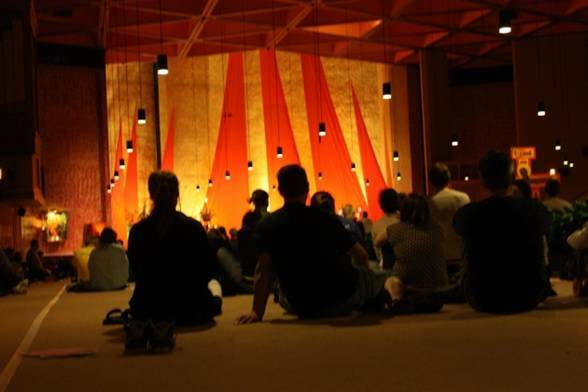 The heart of worship at Taize, as at Taize-style worship around the world, is meditative singing. Songs so simple that they are easily memorized. Short songs, repeated many times, so that the singer can enter a meditative state. Songs in many languages, so that all will be included. And in the middle of the songs, silence. After worship on Sunday, our group met with Brother John, one of three American members of the Taize community. He told two stories that showed how Taize continues to develop new modes of reconciliation. Brother John’s first story was about the Muslims coming to France from the Middle East. 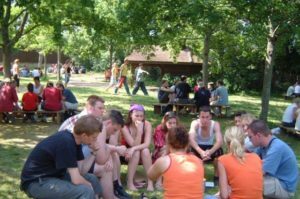 Like religious communities in many countries, Taize began by housing several refugee families on their grounds. Slowly, the numbers grew. Then, in November of last year, the French government called: They were closing a refugee camp at Calais, on the English Channel, and would Taize be a reception center for unaccompanied minors? 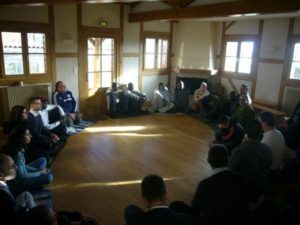 Taize did and, as with their earlier refugee residents, helped them integrate into French society. Then the brothers began to study Islam to better understand their new neighbors, and created a three-day program to enable Christians and Muslims to pray together and work on reconciliation. This has been warmly received by the French Muslim community, and will continue. Brother John’s second story was about St. Louis, Missouri, from which he had just returned after spending several months there. 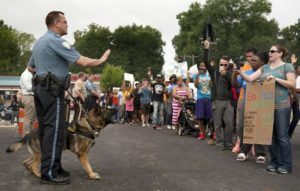 Following the violence in Ferguson in the summer of 2014, the local archbishop had asked the brothers to come to St. Louis, to help with reconciliation between the black and white communities. 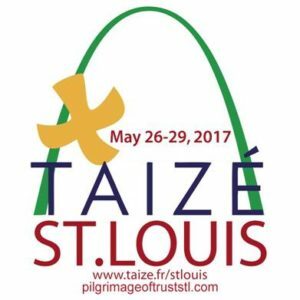 Modeled on Taize’s usual process, in St. Louis there was much singing, talking and praying in small groups. 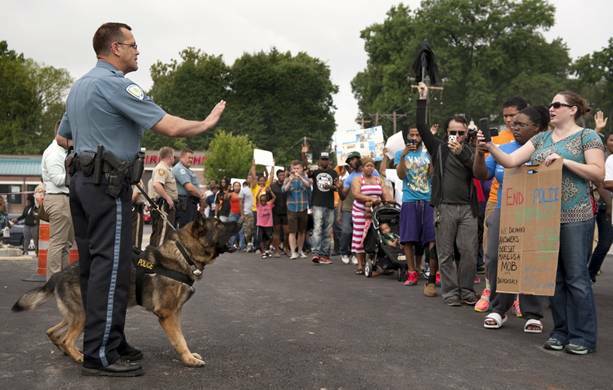 But the reconciliation process involved much more; as in Taize itself, the citizens of the St. Louis area had to learn each other’s languages. (Not only did blacks and whites have to work with each other, but Catholics had to learn how to listen to Protestants, and vice versa.) And to more fully express the hopes and dreams of the black community, Gospel music was added to the usual Taize chants. and a potential blessing for all the families of the earth. wherever there is charity, and love…God is there….